Beloved in His Eyes is the third book in the Angel’s Assassin series. Having grown up as a slave, Gawyn is finally free to live the life he wants. As captain of the guard, he serves his brother, Lord Damien, faithfully and loyally. There is nothing he would not do for him or for the city of Acquitaine. When Damien becomes suspicious of a farm girl, he sends Gawyn to discover what she knows about their past, a past that must remain secret. Justina Auber is a farm girl, raised by a father who was killed by an assassin. She never expects to come face to face with her father’s killer. Now, she must protect her younger brother from the very man who took her father from her. When Gawyn meets Justina, he is instantly attracted to her wit and beauty. As he attempts to find out what she knows about his family’s dark past, he finds himself falling for her. Will his loyalty to his brother demand Justina’s death or will Gawyn betray his brother to save the woman he is falling in love with? 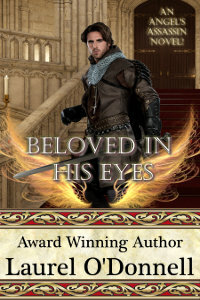 You can get Beloved in His Eyes on Amazon now!